The full name of Clarence Wijewardene, who became the father of pop music with the introduction of pop music to the music world of music, is Vita Kuruppu Arachchige Clarence Arthur Somasinghe Wijewardene. He was born on August 3, 1943 in Haputale, in the time of his father Arthur George Perera Wijewardena serving in Haputale. His father and mother, Soma Kumari Ekanayake was a Christian, and since Baptiste's belonging, Clarence Wijewardene was christened by the Baptist Church. Clarence Wijewardane, who was born as a music treasure, used the guitar to get caught up in the trouble. He was educated at Yatawatta Maha Vidyalaya and in 1968 he formed the Munsters band. At that time he lived in Ratnapura. Clowns Wijewardene's style of Western music was a landmark of country and western, pop Western music patterns. With the help of a meeting with Srigar Devbo Koraya, he joined the radio with a good response to the Saturday Stars program, creating their first five songs, including the songs Mango Black, Heart, Menike, White Menike and Ruwan Pupa. Subsequently, he and Anselly Malwana met Shanaka Perera by playing the Electric Guitar at the buns team, and Clarence Wijewardene who understood that he was able to create it could connect their second songs with Shanaka and Vijith Peiris to the " , Ramani, Rosemary, "The Disc was released. The lyrics of these songs have simple sweetness, but they do not have deep thoughts that come under that simplicity. The melody was also used by the Ramani song for the song "Winter in the morning". He combined his Western style with a mixture of Sinhala music and mixed up with his own guitar playing, making a great change in the music. It was because the verses, melodies, and harmonies were harmonious with harmony. His personalities, personal faces, personages, Syria, his life, his poetry and poetry. Sumudu Saman Flowers, Sumudu Flower Bloomers, Mango Black Aungs. He made many songs for those who are alive. He created the Ramani & Dilhani Duvani songs for Srivarobu Korea. He was grateful for his release of their musical career. In 1969, Kokarathne awakened his Kokila voice and sang for the first time in the music world, singing "Dileepa Little Son" for the son of Karunaratne. The song has become a fanatical response to 2014. This song is more important than the previous one. The " සිහින් සිනිඳු" song by Three Sisters band Indrani Perera is a great song from his hand. Another song from Indrani Perera is his song. The idea is that the moon he created is an individual who is the most powerful songwriter, and I am not allowed to cry, little man, my lone son, for example. In 1971, he and a feat last Golden Chimes band was started. Kimadanāvē my shack, butterfly species feed on, the songs malayi vine launched the first song to the rhythm of the songs Bassanova etæniṇi.ema evolving identity tæṭiyayi.ohugē singing to the rhythm of the song is my shack to create a unique music offers little since. Earlier in the morning creating a heart, a vista of arms, and the rhythm of the songs were created. He also created the song stars mailbox and Anil Bharathi Lankan Perera, a song, about the joy and pain of love. The idea emerged as his special skill to create more and kemṭō dādarā two rhythms. Fisheries life across the ocean swells creating stand than the idea of ​​singing the song before singing the song used in the final part of the guitar sounds and song. He started the Super Golden Chromes Music Team in 1973 and released a number of songs from his village, the upcountry actress, the bambara song which shows that the songwriting and melody, musical direction and singing have the same rarity It was. He was able to mix up the Sinhala music with Western music with songs such as Harvest, Harvest, White Manikay, Syria, and his special talents. Indrani Perera song is "එදා තරම් මගේ සිතේ රැඳුනේ නේ තව දවසක් දුටුවා ඔබ මැද සිටියා විදුලි බුබුළු දසදහසක් "
By the time, he founded the Madara band and later became a freelance singer and music director. Many singer singers identified the difference in his style, who liked to create songs from him. They are Milinth Mallawaarachchi, HR Jothi Palpita, Sanath Nandasiri, Marieeze Gunathilake, Shamali Fonseka and Nilanthi Karunanayake. As a result, Clarence Wijewardene's songs included a number of different rhythm styles, such as Mute Guitar and Chicken picking, highlighting the singularity of the songs, and using my drunken designs such as Jive, Slow Rhythm, such as Jive, Slow Rhythm We meet and secretly we cry, through some examples of golden nerves. We also create the 6x8 (Kamento) tape by ourselves Playing a Rhythm Style, and hardly able to find another one playing the style. It looks at the specialty of his songs. Films and tele-drama is still a place for his high expectations, අපේක්ෂා, කොළඹ සන්නිය, සිහසුන, සිකුරුලියා, නිදිකුම්බා මල්, සුසීමා of songs because more difficult to forget. ඈත එපිට හිමකන්දෙන්, සඳ තනිවෙලා, සැණකෙළියේ, දෑස පියා ගත් කළ of the W.D Amaradeva "සසර ගෙවා දිවි ගමනේ" among prominent. The voice of the singer or the singer through and through him to combine his style. Milton Perera songs " සිකුරුලියා " duet singing I do not have the accusation, Sanath Malkanthie couple singing, සිත රැ වසන්තේ Sujatha and H.R Ugh singing ‘’ සොඳුරු ලොවට මල් වැහැලා ‘’ and Saman De Silva singing songs තණනිල්ල. On the 13th of December 1996, Clarence Wijewardena, a renowned artist who won the award for his songs, commercials and sang in 2000, has won the award, but his voice and creations of the fragrances are eternally immersed in the world. It's the same reason why you can talk about the style of music as it is fresh every day. It is a felony to make this a change and to bring it to the young generation, Shila Wijewardene and her daughter Amila Wijewardena and the family attorney Siri Hettiarachchi are responsible and they are grateful for providing this true information. Once a song has been heard, the song is adorned with various rhythm styles of the guitar, so that the music is made by Clarence Wijewardene.Guthrieves such as Mute Guitar, Chicken picking highlighted the singularity of songs, and among the most popular of Jumbo, Slow Rhythm, such as Drum Beats, I've seen my dying, sleeping in the cottage, secretly crying and distant golden Viminam. In short, he was identified with his own guitar style.His eloquence in films and tele-dramas is evident in the songs of the creation of the throne, sicurulia, mummy flowers, soums, hopes and Colombo.The great artist who has won the awards of the 70, 80 and 90-year-old songs, which he sang nearly 2,000 songs, returned to life on December 13, 1996, and welcomed him to suffer cirrhosis.Even though he lived in a short span of 53 years, he could not value the designs of the arts that he gave to the arts world, and their artistry will be invigorated by the future generations. Wijewardena departed the Moonstones and formed a new music group called the Golden Chimes, with ex-Moonstones bassist Chanaka Perera and Lankika Perera in January 1971. Their first release included "Kimade Nawe", "Mage pelpathe", "Sihin Sinawai" and "Samanalayo." Subsequently English language vocalist Anil Bharati joined. The second EP on Philips label contained "Malai Velai", "Sihil Nuwan", "Surangana Vesvala" and "Mage Viyowen" and third EP contained "Iru Dina", "Sandai Tharui", "Muhudu Rella" and "Thakkita Tharikita. "At this time Wijewardena found a professional lead guitarist Dixon Gunaratne at a wedding.After evaluating Bharati's performance for one year, Wijewardena decided to enter him into the Sinhala pop music scene. Wijewardena composed "Ada Wei Iru Dina" for Bharati which became an all time hit followed by the lovely Christmas song "Bethlehempure" and "Maa Adarai Nangiye". 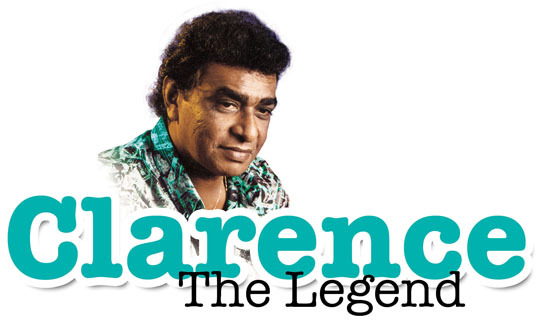 Clarence offered him another all time hit "Tikirimalee" with "Ma Mulin Liyu Pem Pathe", "Desa Vidala", "Bambaraku Aduna", "Sarojini" and "Iru Dina Pamanak".In 1972, Wijewardena and Gunaratne left the Golden Chimes and they both formed a new band known as Super Golden Chimes also with the support of Annesley Malawana in 1973. Wijewardena formed the "Super Golden Chimes" back in the company of his lifelong friend Annesley Malawana. It was one of the most productive music groups in Sri Lanka and together they hit the number one slot in the Sri Lankan music charts on both the Sinhala and English Services of Radio Ceylon and subsequently the Sri Lanka Broadcasting Corporation. For many years they enjoyed the reputation as Sri Lanka's number one group in the 1970s and 1980s After three years Wijewardena decided to go solo when Annesley Malewana announced his plans for marriage.